gallstone gourmet #2. | everything will turn out alright. i thought this whole eating a super low-fat diet would be really hard. but you know what? IT’S NOT. gallstones hurt. like, really really REALLY frickin’ HURT. at the end of the day, it’s not difficult to vividly remember the consequences that come with that brownie a la mode i’ve been craving. i’ll take frozen yogurt with raspberries, please! now for the past week’s gallbladder-friendly recipes! 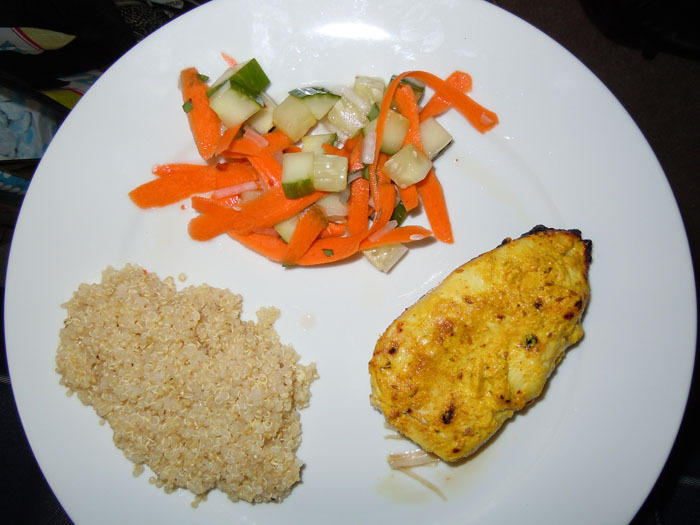 last week we had yogurt and spice marinated chicken breast, thai-style cucumber salad and quinoa. 1. Place all ingredients except the chicken in a large (1 gallon) zip top bag. Seal and bag and shake to mix well. 2. Add the chicken breasts to the bag, squeeze out as much air as possible, and seal. Place in the refrigerator to marinate anywhere from 3 hours to overnight. I made mine the morning of the same day, so they got about 6 hours. 3. Place your oven rack in the top most position and preheat the broiler (make sure to keep the oven door cracked!). 4. Remove the chicken breasts from the zip top bag and place them on a rimmed cookie sheet lined with foil. Spoon a little bit of the leftover marinade over the top of the chicken and place under the broiler. 5. Broil for 7 minutes on one side and 5-6 on the other, watching closely to make sure it doesn’t burn, until the chicken is cooked through. Serve immediately! this is a recipe i concocted while still in college. the chicken is so flavorful and the yogurt marinade keeps it super moist. leftovers taste great sliced and served cold over a salad or on a sandwich. if you are lucky enough to own a grill, i would suggest grilling the chicken! i don’t have one, but a broiler is basically an upside down grill, so it’s all good. 1. In a medium-sized bowl, whisk the sugar into the rice wine vinegar until it dissolves. 2. Whisk in the chili garlic sauce and soy sauce. 3. 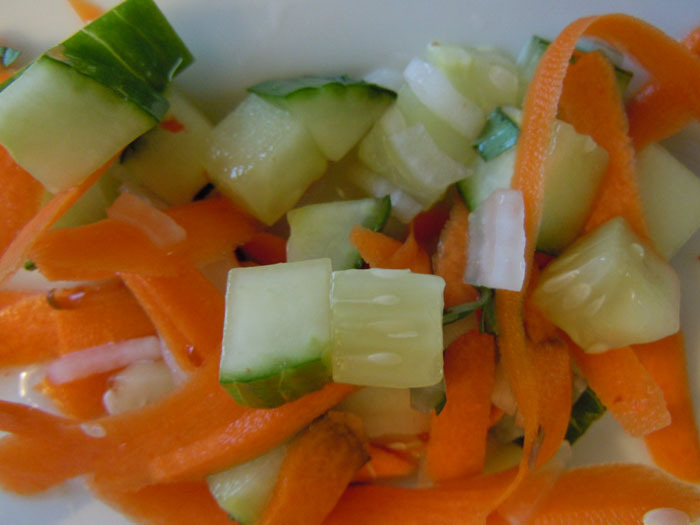 Add the cucumbers, carrots, and onion and stir to combine. 4. Cover and refrigerate for at least several hours (overnight is best), stirring every few hours. this salad is tart, slightly sweet, a little spicy and absolutely fat-free. SO GOOD. i don’t think i need to write out a recipe for the quinoa. just cook according to the directions (either on the package or you can easily find them online) and simply add salt, pepper and squeeze a little lemon juice over the top. serve warm or room temperature. 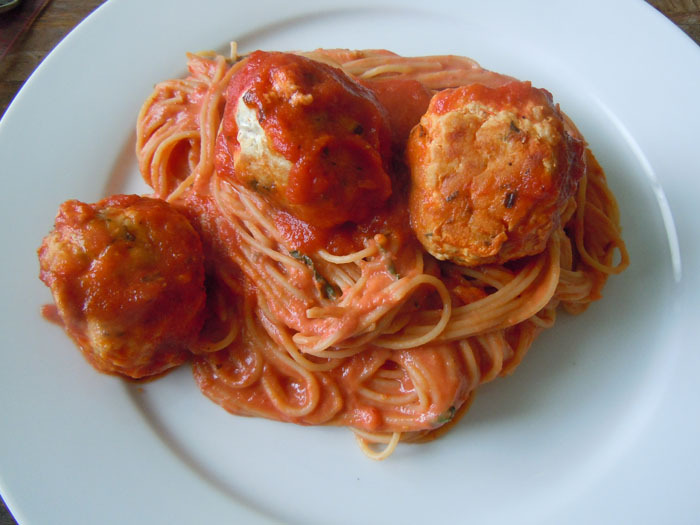 i also made spaghetti with turkey meatballs for dinner last week. 1. Place a saucier or other high-walled pan over medium heat. Add the tomato sauce and heat through, whisking occasionally. Add the garlic and chili flake, and salt and pepper, whisking to combine. 2. Allow the mixture to come to a low simmer and whisk in the cream cheese until well incorporated. 3. Stir in all of the fresh herbs right before serving. 2. Add all of the ingredients into a large mixing bowl, use your hands to break up the turkey and combine. 3. Place a deep, oven safe pan (which has a matching lid) over medium high heat, spray throughly with olive oil flavored cooking spray. 4. Roll the meatballs into 1.5 inch balls and place in the hot pan. Turn every minute or so to sear on all sides. 5. Remove the pan from the heat. Spoon about half the sauce you made earlier over the meatballs, clamp on the lid, and place in the oven. Cook 10-15 minutes while you cook the pasta. for the pasta, simply boil your favorite kind (i used this kind for the extra protein, omega 3 and whole grains) in salted water until done. drain well and add into the pan with the remaining sauce. use tongs to mix it all together. place a serving on each plate and top with a few meatballs. enjoy! i am in LOVE with this pasta sauce. the fat-free cream cheese makes it unbelievably creamy. seriously, it tastes like there’s a fair amount of heavy cream in there! the meatballs are delicious and have almost no fat. just be warned, when using such lean meat, they can get dry very easily. to prevent this, you can mix in a tablespoon of olive oil before rolling them. searing the meatballs before baking and covering with a lid will keep them from getting too dry. this concludes this week’s gallstone gourmet! tune in next monday for turkey burgers with crispy oven fries, chicken creole, and farro risotto with shrimp, scallions and snap peas! NOW A NOTE FOR MY READERS: what would you like to see more of here on DWB? more recipes, pictures, humor, sap? PLEASE LEAVE A COMMENT OR EMAIL ME AT SARAKHINKLE@GMAIL.COM AND LET ME KNOW! i want to hear from you! THANKS! This entry was posted in Uncategorized and tagged food, gallbladder, recipes, the gallstone gourmet. Bookmark the permalink. farro is so delicious. i completely understand his addiction. i miss you. we should talk soon. it is delicious, easy, and essentially foolproof. in other words, IT IS AMAZING. Yum! I love your site just the way it is and always look forward to your posts. You should post a picture of you and Travis up sometime. I love seeing soon to be daddies standing all proud and loving next to their preggo wife. Cutest thing ever! Good idea! I will keep that in mind for sure! I’ll try to get Trav to have a little photo shoot with me later in the week. I googled Gallstone friendly recipes and your blog came up. Thank you for this! I found out last night in the most painful way ever that I have Gall Stones. You’re very welcome. Ugh. Aren’t gallstones just the worst? I remember the night I found out I had them. It was the most painful 4 hours of my life. I still maintain that it was way worse than 15 hours of unmedicated back labor. THANK YOU!!! I am now excited about what I might eat this weekend – yogurt chicken here we come. I just found out about my gallstones but I’ve been suffering with them for a month trying to get it sorted as to what was wrong with me. I’m coping by figuring out what I can eat that won’t make me double over in pain between now and my surgery. And I just love turkey meatballs, so I might make those too. Hoorah! So glad these could be of help! That yogurt chicken is really delicious. I’ve made it many times since! Good luck with your gallstones. I’m getting my gallbladder out in March, after a year of suffering frequent attacks. Huzzah! Thank you for stopping by!